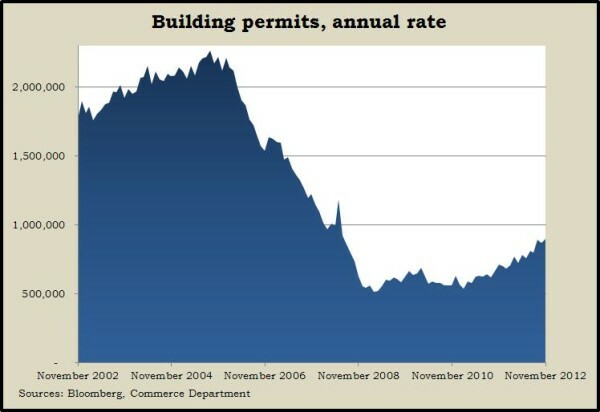 In another sign that the housing industry is at long last recovering, the annual rate of building permits climbed to its highest point since before the 2008 financial collapse in November. The rate of housing starts slowed a bit, but November capped off the briskest three-month residential construction period in four years, according to Commerce Department data. The U.S. economy grew faster than expected in the third quarter, as the Gross Domestic Product rose at a 3.1% annual rate. That was more than the Bureau of Economic Analysis had earlier estimated, more than analysts had forecast and more than the 1.3% rate in the second quarter. The bureau said greater commercial investments, exports and government spending helped boost the expansion. The National Association of Realtors said existing home sales rose in November to their highest point in three years. A continued decline in the number of foreclosed houses on the market helped lower the supply of properties to the least in seven years, which helped raise the median sales price 10% higher than it was in November 2011. That marked the ninth month in a row of year-over-year price increases. The moving four-week average for initial unemployment claims shrank for the second week in a row, dropping more than 10% in the last two weeks after a surge in activity from Hurricane Sandy. Labor Department data showed Americans continued to lose jobs at a rate that has made little progress all year, though losses remain 44% below the recession peak. The Conference Board’s index of leading economic indicators dipped in November, suggesting a slow start to 2013. Stagnant employment and a slowdown in manufacturing orders have offset gains in housing and financial markets, according to the business research group’s data. Another sign of continued moderate economic expansion was that both personal spending and personal income rose more than expected in November. The Bureau of Economic Analysis reported further evidence of a rebound from Hurricane Sandy disruptions. The personal savings rate rose to 3.6% of disposable income, and a key measure of inflation showed a 1.5% annual rate, still below the Fed’s target of when to ease up on monetary stimulus. Despite signs of positive momentum continuing for the economy overall, consumer sentiment took a dive in December, apparently because of lingering uncertainty over the fiscal cliff. The University of Michigan/Reuters survey showed consumers lowering their expectations for six months hence, dropping to a sentiment index reading of 72.9 from a post-recession high of 82.7 in November. The index fell to 55.7 in August 2011 when Congress tussled over the debt ceiling.